Club Penguin Cheats by Mimo777 Club Penguin Cheats by Mimo777: Club Penguin's Sensei and Halloween News! Cool! 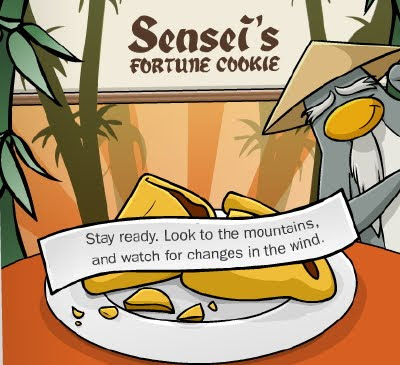 The Club Penguin Times has a Fortune Cookie from Sensei. It says "Stay ready. Look to the Mountains, and watch for changes in the wind." Sounds like the Halloween Storm will be coming again. Tomorrow there will be new Halloween Costumes in the Penguin Style Catalog. Club Penguin promises there will be a bunch of new costumes. So, be sure to check back here tomorrow for all the cheats. Saweet, I love the Halloween party! What is your favorite thing about the Halloween party? I love the different weather during the Halloween Party!!! I love the free clothing and the Lolly hunt! I loooove the new costumes! My fave so far is either the bee or the ghost. COOL!!! I WANNA SEE THE CHANGES! WOOT WOOT NEW MOD SHAKE UPS! for becoming NEW OFFICIAL CPG MODS! WELL DONE GUYS! IM HAPPY UR OFFICIAL CPG MODS NOW, u all deserve it!, and welcome back Stickers 303! we missed you dude! WOAH! long comment LOL, well done to everybody who made the mod list and who even got modded, and sorry for people who got de- modded. I love how it's dark out all day, and I also like how they play "the night of the living sled" and other movies in the lighthouse! The halloween party is my favorite! with an AWESOME hat! That hat will be different from the others because CP told; Anniversary hats-including beta hat- WON'T come back!!! My fav part is the decoration thats all over clubpenguin, its sooo cool! And my other fav part is the candy hunt! its really fun! Look at the color's of the gnomes in the club penguin blog. There gray that means that might be a color!. Mimo! Mimo! Check page a2 and a3 Its a sneak peak of a costume! its a snow-wizard! Mimo, How do i become a (CPG MOD) and what is my job? Goofy73 and Wiiwii1 for becoming Mimo Mod's! Congrats to everyone who got added to the list as well, not slong before you'll be meeting Mimo somewhere in CP! You'll do well, and keep up the good work! I never went on it last year, people say that you can kill a penguin when it's halloween, is this true?????? I thought u were one dude, r u? hey mimo! on gnome decide i can see gray color. how do you think - does they gives us gray color like sensei? one of my faves were the dojo with sensei and the thunder and lighting! whoops supposed to be Club Penguin Gang Moderator. __________________________ I thought it was just some thunderstorm. If it was an eclipse, wouldnt the whole sky just be pitch black? And I thought they only lasted for a few minutes. My membership's running out tommorrow so I can't get the costumes. However, I will still get lots of other stuff. *does a goofy smile* Last time my membership ran out, it was on the day white puffles came. And you are also making a good job, Saavy! :D You rock! I like that too! I love Halloween! Yeah i think you do. Technically you can leave a comment as Anonymous and put your name plus cpg mod at the end of it but having a account makes it mych easier. My fave part of it all is just dressing up,and buying all the cool halloween costumes!The eclispe is cool too. So add that to my list of things i like! Can't u get more membership? ___________________________________Nope. That would be too violent, CP is made for kids and teens, not adults. Mmm,and something is going on at Stage of Squdzoid,but this time,there are two monsters. Nope. When you go to leave the comment, click the bullet that says "Name/URL". Then just type your name in the name box. You dont need to put anything in the URL box if you dont want. I would know, I dont have a Blogger or a Google account and i'm a Legendary Mod! Thanks Saavy, youre not doin to bad yourself XD Actually, slinky59402, Sissyc97, Lollypop5465, and FRockle92 were already mods, im not sure about Dooyaga though. I thought it was just some thunderstorm. If it was an eclipse, wouldnt the whole sky just be pitch black? And I thought they only lasted for a few minutes. Club Penguin used to have an eclipse every year for the Halloween party, but last year they had a storm instead. Yes, Saavy is a mod, but he didnt get promoted this time because he is already a Mimo Mod, so he didn't say anything about himself. Your job as a CPG Mod is to answer questions people have, like yours, for example. What you do is copy their answer by highlighting it, right clicking on it, and clicking on copy. Then you paste their answer in the comment box. You do that by right clicking in the box, and clicking paste. Then you leave your answer under it. You need to skip a few lines so people can tell the difference between the question and the answer. Finally, at the end, add your CP name with (CPG Mod) next to it. Just answer a bunch of questions, and eventually, youll be a mod! Yeah, I love the Halloween party. This will be my.... 4th Halloween party. They rock! the forture cookie always means somthing big is going to happen! Also remember the party is how ninjas became ninjas.without it no lightning! with out it no dojo covered in snow! that means no ninjas! I like all those things too! MIMO IF YOU DO LOOK IN THE MOUNTAINS BEHIND THE DOJO TRY ZOOMING IN AND YOU WILL SEE A PATH THAT LOOKS LIKE IT LEADS TO THE VOLCANO. No, that is just a rumor around to scare people, put out there by the people who are demented in the bad way. There is no killing on club penguin. Hope this helped! I guess cp has odd eclipses. Any kind i hear about last for just a little bit, ya know cause da earth is movin so fast. cp parties are days long. I kinda like the storm anyway, the effects r thweet! i dont think we will get a new color they just made it grey like a maniquin u know? Hey mimo! I was just wondering if you still wanted to know where flojogirl is. shes my cousin. Well Idk if you can do this, but if you can, could you tell everyone that Flojogirl is Bl0wfishh. BTW blowfishh use to be a member but her gave his acc to his sister. lol, keep on blogging mimo! Look to the mountains and look for changes in the wind; if you look to the mountains today, the volcanoe is red and you can see that the mountain's smoke is blowing to the left. i think there is a hacker in cp! cause i looked on cp this morning on my clothes were diffrent. and i did not change them!so watch out. I am so puting this on my blog! i cant wait for the hallowean party but cp need to hurriy up with this volcano thingi im boarding to death!